We’re big fans of Ada Twist and Rosie Revere at our house so I was excited to see a new chapter book series featuring the same characters. The first book features passionate engineer Rosie Revere. 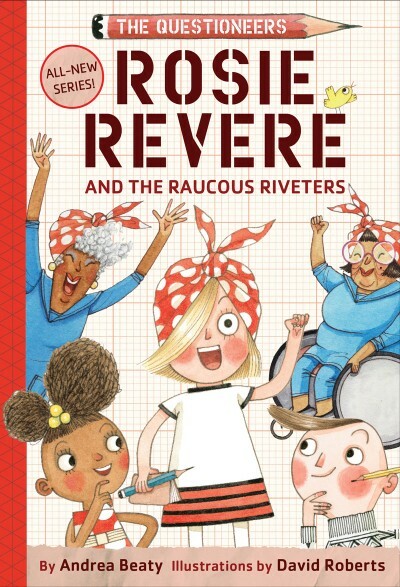 I loved Rosie Revere and the Raucous Riveters from the start. Here, we learn a whole lot more about Rosie and her friends. As a fan of the Questioners books, everything made perfect sense. If I weren’t already a fan, I might have a few fairly insignificant questions, but I think I’d still love it. Author Andrea Beaty Slips seamlessly from picture book rhymes to accessible early chapter text. And David Roberts’ black-and-white illustrations are delightful. The suggested age range for The Questioners series is 6-9, but I foresee this becoming a chapter-at-a-time staple in my soon-to-be 5-year-old’s bedtime routine.